Ben Urich in the new series of Daredevil - complete with Easter eggs on his wall. Daredevil episode 3 ups the ante on violence - and has its first procedural episode. SPOILERS below. The third episode of Netflix's Daredevil settles into a procedural format. Here's the courtroom drama that fills half of Matt Murdoch's life, with Daredevil taking to the streets to administer his own brand of justice. The story involves Nelson and Murdoch being hired to defend a contract killer - a case Nelson is keen to take on for the money, but is surprised when his partner agrees. Murdoch has his own reason for taking the case - it's a stepping stone on the way to figuring out who the bad guy is behind things in Hell's Kitchen. Three episodes in and we see the Kingpin for the first time. We barely know him but we know he is ruthless and to be feared from what we've seen so far. Here again, we have the contract killer, a mean piece of work himself who in the opening swiftly despatched his target after taking down his bodyguards in a flurry of action (that also told us that Turk Barrett's word as a salesman isn't worth very much, as the gun he sold the assassin jammed at just the wrong moment). When faced with the knowledge that giving away the Kingpin's name will bring down hell on not just him but everyone he knows, he takes the most gruesome of ways out - if you doubted the more adult market for Daredevil, doubt no more after this unfortunate intersection of head and spike. Meanwhile, the senior mobster that new arrival to the series Ben Urich tries to hit up for some information for a newspaper story is saying nothing. By the time we meet Wilson Fisk in the closing moments of the show, there's a palpable sense of menace. 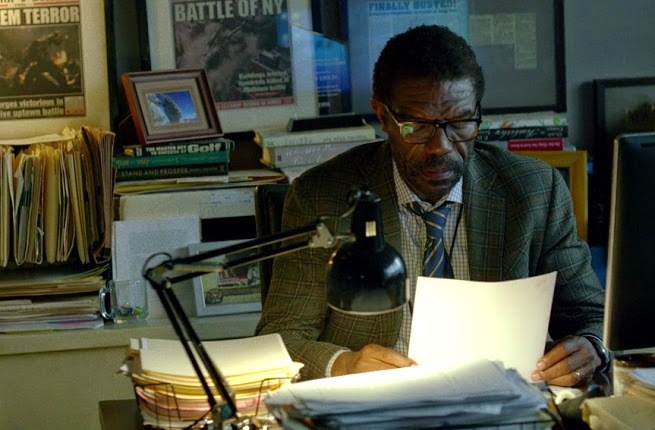 Ben Urich is a great journalist, and played here superbly by Vondie Curtis-Hall with a hangdog look and a steady, plodding determination. On his wall, he has old front pages talking about the Battle of New York and the Harlem Terror of a Hulk on the loose. And he works with an idiot who thinks bloggers are getting rich, rich, rich, baby. Although maybe the underwear part is true. Sadly, rights issues mean that he doesn't work at the Daily Bugle, but instead at the New York Bulletin. I kind of wished he was at Marvel's upstart outlet, Front Line, if he couldn't be at the Bugle, but maybe that's in his future. I sure can't see him putting up with that editor for too long. This is our first real chance to see the legal side of the team in action, and it's pretty darn good. Sure, you have Murdoch using his super-hearing to listen to the jury's heartbeats to find out which way they are leaning with regard to a verdict, and to pick out a juror being blackmailed to remove them from the panel, but you also see how each of the lawyers performs. There's the eager charm of Foggy Nelson, but that's overshadowed by Murdoch's clear-stated charisma and analytic approach. It'll be interesting to see how much courtroom material we get as the series goes on - not too much, I hope, enough to give a different flavour without falling into a rut.